Construction of the new Sir Thomas Mitchell Bridge over the Maranoa River is now complete with the bridge opening almost a year earlier than scheduled. The Sir Thomas Mitchell Bridge is a critical link for south-western Queensland communities, as well as the livestock and transport industries. The new bridge, located a few metres downstream from the existing bridge built in the 1950s, will align with Mitchell’s main street delivering better traffic flow and safer driving conditions for motorists. While all road users will benefit, the new bridge will also allow the movement of Type 2 road trains which will deliver significant economic benefits to the local freight and livestock industries. I congratulate the project team on their incredible job bringing the new bridge to completion almost a year earlier than scheduled. The bridge is 900 millimetres higher and over three metres wider than the old bridge, with a dedicated pedestrian crossing and lighting. This will provide safe and reliable access for pedestrians across the Maranoa River. The $16.8 million bridge is part of the Warrego Highway – Roma to Mitchell project, which is jointly funded by the Federal (over $44 million) and Queensland (over $14 million) governments. The Federal Labor Government will provide $1 million in funding towards restoring and reopening the Kirrama Range Road, in the Cardwell Range. This investment will help restore an important link to the Tablelands, providing a boost to local tourism operators and the cattle industry and restoring access for traditional owners. Funding will go towards the replacement of 10 bridges, the resealing and replacement of gravel on sections of the road. Kirrama Range Road is a key gateway to the Blencoe Falls National Park and improving its condition will make it accessible to vehicles other than 4WDs. The road has been closed following significant damage by Tropical Cyclone Larry. Reflecting the fact this road is a council responsibility, funding is conditional on both the State Government and Council confirming their funding contributions and Council maintaining the road into the future. This funding forms part of Federal Labor’s record investment of $16.6 billion under our Nation Building Program to upgrade and modernise the Queensland’s road, rail and public transport infrastructure. Works are due to start in November 2013 with the full upgrade to be complete by mid next year. A new tax incentive to support up to $25 billion in new private sector infrastructure spending has commenced this week. The new tax incentive for major infrastructure projects is a key achievement of Federal Labor’s national infrastructure reform program. The Federal Labor Government is delivering reforms to the way our nation plans, prioritises, funds, builds and uses infrastructure, having commenced with the establishment of Infrastructure Australia, in 2008, to advise on the nation’s top infrastructure priorities. Under this new tax incentive, the Infrastructure Coordinator can designate projects eligible for the tax concession, with a pre-requisite that it has been assessed as ‘Ready to Proceed’ on Infrastructure Australia’s Priority Project List. This incentive will encourage private sector investment in nationally significant projects by preserving the value of tax deductable project losses over time and making it easier for investors to access these losses. The tax incentive will also stimulate innovation in the private sector, for example, by encouraging investments in smart infrastructure that better utilises our existing infrastructure such as the roll out of managed motorways technology. Federal Labor is delivering record investment in infrastructure, through our $60 billion Nation Building Program, but we also recognise the need to mobilise private capital. This reform will support major transport projects that transform our cities and make our international gateways more competitive, and expand the infrastructure pipeline more broadly. Potential applicants should visit Infrastructure Australia’s website at www.infrastructureaustralia.gov.au/taxincentive for further details and to register attendance at the workshops. Two contractors have been shortlisted to design and build the Warrell Creek to Nambucca Heads section, bringing us closer to a four lane Pacific Highway between Warrell Creek and Urunga. Deputy Prime Minister and Federal Minister for Infrastructure and Transport Anthony Albanese and Acting NSW Premier Andrew Stoner today announced that Abigroup and the Acciona Ferrovial Joint Venture have been selected to proceed to the next phase of the tendering process. Mr Albanese said the project is part of the ongoing upgrade and full duplication of the Highway, the most expensive and complex road project ever undertaken in Australia. “The preferred tenderer for the Warrell Creek to Nambucca Heads section will be announced later this year, and building is anticipated to start mid next year,” he said. “In the meantime, land acquisition and investigations are continuing in the lead up to major work. This preparatory work will ensure construction of a four lane divided road connecting Warrell Creek and Nambucca Heads can proceed as quickly as possible. The 20 kilometre Warrell Creek to Nambucca Heads section will include interchanges at South Macksville and Warrell Creek and new bridges over Warrell Creek and the Nambucca River. Further south, work to upgrade the Pacific Highway is progressing well with building tenders invited for the Kundabung to Kempsey section. Mr Stoner said the14 kilometre upgrade between Kundabung and Kempsey is part of the Oxley Highway to Kempsey Pacific Highway project, which will provide 37.8 kilometres of four lane divided road between the Oxley Highway at Port Macquarie and connect with the recently completed Kempsey bypass. “This upgrade will deliver safety benefits and smoother driving conditions for the 13,000 motorists and truck drivers who use this section of the Pacific Highway each and every day,” Mr Stoner said. The Oxley Highway to Kempsey upgrade will include interchanges at Blackmans Point, Haydons Wharf and Yarrabee roads, Kundabung and Sancrox. It will also involve construction of a bypass of Telegraph Point, an overpass at Bill Hill road, new bridges for the Hastings and Wilson rivers, the North Coast Railway and creek crossings, as well as rest areas in both directions. Both projects form part of the ongoing upgrade and full duplication of the Pacific Highway, a massive nation building project being jointly funded by the Federal ($7.9 billion) and NSW ($2.5 billion) governments. Regular users of the Bruce Highway near Gin Gin will soon experience safer driving conditions following the start of work to realign a 6.7 km stretch of the highway between Cabbage Tree Creek and Carmans Road. Deputy Prime Minister and Federal Infrastructure and Transport Minister Anthony Albanese said the upgrade will be completed late next year. “Traffic volumes on the Bruce Highway continue to grow, so I’m pleased that these works will improve safety for the more than 3,500 vehicles that currently travel this section of highway each day, almost 30 per cent of which are heavy vehicles,” Mr Albanese said. “The alignment of this section of the highway will remove tight curves and increase sight distances for motorists, making it easier to see other vehicles. “An overtaking lane will be built for each direction of traffic, and two heavy vehicle rest stops will be constructed to cater for north and southbound motorists. Queensland Deputy Premier and Member for Callide Jeff Seeney said interim safety measures had been implemented as part of the project. “There will be additional signage in place and a reduced speed limit on some sections of the existing highway while the works take place,” Mr Seeney said. “Side tracks will also be in place to allow the connections to the new alignments to be built. “Meanwhile, works commenced last year to flatten and realign a 3.7 kilometre stretch of the highway further north across Back Creek Range. “The project will work to improve the vertical and horizontal alignment along this stretch and will bypass the section locally referred to as the ‘Big Dipper’, with works expected to be completed by mid-2014. The Federal Labor Government is providing $80 million towards the combined $100 million cost of the Cabbage Tree Creek to Carman Road upgrade and Back Creek Range upgrade. “Last year, crews also began working on a $20 million federally funded project to improve a 1.6 kilometre section of the highway on the southern approach to Gin Gin,” Mr Albanese said. These safety works are part of the Federal Government’s unprecedented $5.7 billion investment to upgrade the Bruce Highway. Deputy Prime Minister and Minister for Infrastructure and Transport, Anthony Albanese, and Minister for Finance and Deregulation, Senator Penny Wong, have today announced the appointment of Ian Hunt as the new Chief Executive Officer of the Moorebank Intermodal Company following an international executive search. “Mr Hunt brings 30 years of infrastructure experience to the Moorebank project, having worked on a diverse range of projects including public private partnerships to deliver a major urban motorway and rail rolling stock,” Mr Albanese said. The Moorebank Intermodal Company was established in December last year to engage and oversee the private sector development of the Moorebank Intermodal Terminal, a nationally significant infrastructure project which will help boost Australia’s productivity. Senator Wong said Mr Hunt will work closely with the Moorebank Intermodal Company Board, led by Dr Kerry Schott, to facilitate the private sector development of the Terminal. Once up and running, it’s forecast that the Terminal could remove 1.2 million trucks from Sydney’s roads each year – equivalent to 3,300 trucks per day. In addition, the Terminal will generate around $10 billion in economic benefits through increased productivity, reduced freight costs, reduced traffic congestion and better environmental outcomes. Dr Schott thanked Lucio Di Bartolomeo who has served as interim CEO over the past six months. “Under Mr Di Bartolomeo’s leadership, the Company has swiftly built momentum,” Dr Schott said. The formal procurement process is expected to commence in August 2013, with construction of the Intermodal Terminal planned to commence in mid-2015. It will open for business in 2017. Small-to-medium businesses and not-for-profit organisations in Bendigo will receive free expert advice on how to make the most of the National Broadband Network (NBN). Local business association iBendigo will deliver training services as part of Rudd Labor Government’s Digital Enterprise program, working with local businesses and the community to raise awareness of the many benefits of high-speed broadband. The Bendigo Digital Enterprise will deliver group seminars and one-on-one support sessions, which will include training on website development, telework, cloud computing, online marketing, e-commerce, and social media. iBendigo will receive a grant worth $250,000 to deliver the training that will help the community and local businesses to compete globally and create the jobs of the future. The grant is subject to the finalisation of funding negotiations. The Bendigo Digital Enterprise is one of 70 that the Rudd Labor Government is establishing across Australia. More than 7,600 organisations have already benefited from the advice and free training that the enterprises are delivering. For a list of service providers announced under previous funding rounds or more information please visit: www.dbcde.gov.au/digitalenterprise. More areas in and around Coffs Harbour, New South Wales, are getting access to the National Broadband Network’s reliable, high-speed broadband thanks to the Rudd Labor Government. Over 14,000 homes and businesses have today been officially switched on to the NBN across the Coffs Coast, including in Sawtell, Toormina, and more areas in Coffs Harbour. There are now around 16,900 homes and business on the Coffs Coast that can now connect to the NBN, with even more coming online over the next few months. I urge everyone who can to sign up to the NBN and experience what it has to offer. The people of Coffs Harbour are already embracing the NBN. In areas that switched on only six months ago, local households are signing up at world leading rates. The NBN opens up huge opportunities for the Coffs Coast in education, business, and health care. To highlight what the NBN makes possible, I launched the My Health Clinic at Home program. The Rudd Labor Government is providing $2.5 million to Feros Care to help older Australians living in Coffs Harbour have their health conditions monitored from home by connecting them, via the NBN, with nurses based in Coolangatta, Queensland. Feros Care estimates using telehealth will save their nurses approximately 8000 kilometers and 160 hours of travel time annually, allowing them to treat almost double the number of patients over the course of the year. Programs like this highlight how important Labor’s NBN is to productivity gains in health care and right across the economy. 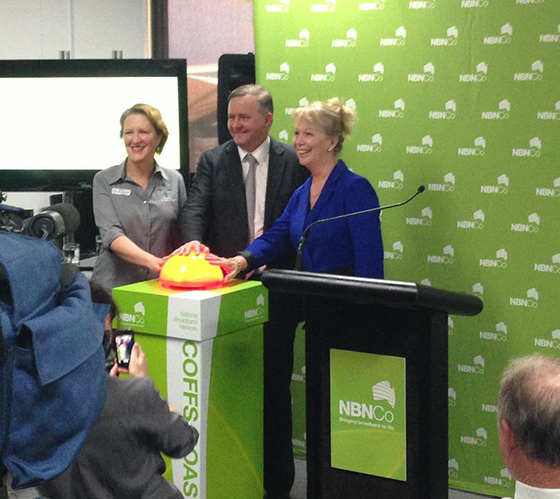 The NBN has today been switched on to another 8,900 homes and businesses in Coffs Harbour, bringing the total number of premises able to connect to the NBN to more than 11,500. This includes Coffs Harbour and North Boambee Valley. NBN fibre services are also available to around 5,400 homes and businesses in Sawtell. This includes Boambee, Boambee East, Bonville and Toormina. NBN fibre construction is set to be completed in the coming months for other areas within Coffs Harbour, including Korora and Sapphire Beach. NBN fibre construction is set to be completed in the coming months for other areas within Sawtell, including Boambee East and Boambee. NBN fibre construction has commenced or is complete for more than 240,000 premises. NBN fibre construction is expected to commence or be completed for 1,416,800 premises by mid-2016. Australians travelling overseas will be better able to avoid ‘bill shock’, following the registration of a new standard on international mobile roaming. The new Australian Communications and Media Authority standard requires telecommunications companies operating international mobile roaming services to provide Australians with more information about their use and how much they will cost. Australians frequently experience ‘bill shock’ when using their phones and smart devices overseas because the rates for international mobile roaming services, including internet access, can be up to 150 times more than what they are charged at home. These outrageous prices mean that too many Australians are coming home from an overseas holiday and being confronted with a mobile phone bill that costs more than the trip itself. By ensuring telecommunications companies provide timely and relevant information to their customers means such ‘bill shock’ can be avoided. The new standard will result in Australians travelling overseas receiving warnings about the higher charges that may apply while using their mobile devices; information on how to opt out of roaming services; what charges they can expect from such services; and how to access spend management tools. The new standard applies to all Australian mobile providers and will cover all countries where Australians use international mobile roaming. The measures in the standard will be phased in progressively from 27 September 2013. I welcome today’s release of Infrastructure Australia’s fifth annual report to the Council of Australian Governments (COAG), which sets out the pipeline of projects and policy reforms it believes will secure Australia’s prosperity in the 21st Century. This report marks the first five years of Infrastructure Australia and acknowledges the improvements to infrastructure planning and development that have occurred. The report also updates the National Infrastructure Priority List of projects which have been rigorously assessed and found to offer the highest economic, social and environmental returns. As a result of this year’s Budget, all ‘ready to proceed’ projects identified by Infrastructure Australia since its establishment in 2008 have received Federal funding commitments. This year a record 79 project proposals were submitted for assessment and the number of projects added to the priority list more than doubled. Federal Labor recognises the importance of getting the investment decisions right which is why we established Infrastructure Australia and continue to deliver reforms that complement our $60 billion Nation Building Program. I congratulate Sir Rod Eddington, his fellow Council members and the staff of Infrastructure Australia on continuing to drive lasting reforms to the way our nation plans, finances, builds and uses the infrastructure which makes people’s lives easier, our businesses more competitive and the Australian economy more productive. The 2013 report – National Infrastructure Plan exemplifies the important role that Infrastructure Australia continues to perform, providing leadership in developing a long-term, evidence-based approach to infrastructure reforms and investment. For this year’s full report to COAG, go to: www.infrastructureaustralia.gov.au.